In 2009, Alon Nir, started a Twitter account for the @TheKotel. When he did this, thinking it would be cool, he didn’t realize the impact he would have on a generation who relied on their prayers but didn’t have anyone to place them in the Western Wall. Alon’s mission statement is: To affect change by facilitating prayer. Alon, an economist by training, created a Twitter page for @TheKotel, which is available for anybody in the world, from any denomination, who wants to tweet a prayer and have someone cut & rolls it and sticks it in The Wall for them. Alon shared his economic view as a non-profit, of how to be an anti-startup (non-profit) & succeed at the 140 Character Conference in New York. Alon tells the crowd about some of the principles of @TheKotel’s success. The Western Wall in Jerusalem has great divine presence. When he set-up a twitter page for @TheKotel he didn’t realize the impact, but when the media picked up the story CNN, BBC, Fox News, Reuters, New York Times, France Deux, Romanian TV things went wild. “I’m overwhelmed”, some of the replies included, “God won’t give you more than you can handle”; and then guess what? Twitter suspended the account, twice, as they suspected that @TheKotel was a spammer. The thing is that he got so much traffic, so many followers and so many prayers, in such a short period of time. This was a blessing in disguise as so many prayers needed to be processed. Suddenly his project became A Cause, and people quickly came to assist. An easy software program was introduced by his brother instead of cut & paste, and some volunteers appeared and suddenly the prayer for cutting and folding prayers was answered. The idea of a prayer sweatshop was swept aside as people and technology provided solutions, which eventually brought about the beginning of the iPhone App. The new iPhone App came into being after the 140 conference in Tel-Aviv. The service was originally launched on Twitter, and an iPhone app ensued. Now it is time to develop an app for the Android mobile operating system, and to pay for this project we have opened a donations page for contributions. All funds will be used for the Tweet Your Prayers @TheKotel operation, even if we fail to reach the goal, or exceed it. Merely sending a prayer to the Western Wall can change people’s lives. 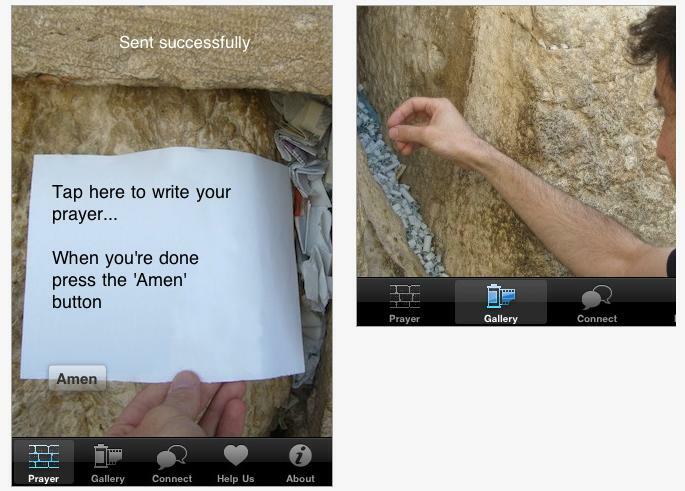 Practice the centuries-old Jewish tradition of placing prayers in the Western-Wall (a.k.a the Kotel) via Twitter. Visit the website for more information. TechDocs – Technical and Marketing Writing services specializing in synthesizing traditional and new media skills to generate creative signature copy for companies worldwide. TechDocs is a champion of Women in Business & sponsors PROWomen Meet – The Women’s Startup Network.